This is the 15th post in my series "Asking Myself," in which I weekly ponder one question posed in Teresa Blythe's rich book, 50 Ways to Pray. You can find the start of the series here and last week's post here. The first nine posts focused on theological musings, while posts 10 to the present prayerfully consider the specific questions Jesus posed in the New Testament. I covered this in detail in a previous post about Matthew's version of Jesus sleeping in the boat. So to avoid rehashing it, I thought I would pull out this question as it speaks to me now, somewhat detached from its original, stormy context. 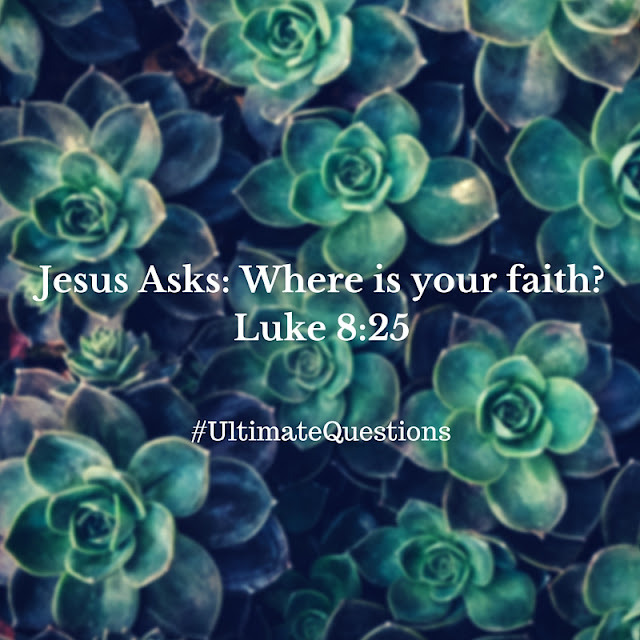 While this question could be interpreted as Jesus saying we have no faith, and why don't we go get ourselves some, I hear it a little differently. Let's assume a philosophical posture that everyone has faith, but we all put faith in different places. For instance, most of us have faith that earth's gravity will keep our feet on the ground, the sun will not forbear to shine, the oceans will obey their boundaries, time will continue to advance, etc. We daily choose to assume our loved ones will still be here tomorrow and that our own heart will continue beating. It isn't always the case, but why live in morbid fear of what could be? We make this choice to believe often enough that it becomes habit, second nature, faith. Of course, as Christians, we'd affirm nothing should be taken for granted, and life should be savored moment by moment or seized with wild exuberance, depending on our personalities. It really could end and we do not know the day nor hour. Yet I think it's good and right that we trust our basic assumptions about our worlds continuing on as they should. For without this modest set of beliefs about our own existence, we would be paralyzed with fear. It struck me as I wrote that, for some people, those whose paradigms are ravaged by war or sickness or natural disaster or crime, do find their basic safety at risk. They do become victims of a faith misplaced, jostled about and never fully resettled. And there's Jesus, asking all of us —the rattled and the serene — where our faith is. Interpreted thus, he is really asking where are we putting our faith, and ultimately, he's inviting us to pin it fully on him. To trust the sun will rise tomorrow, yes, but even more to trust that if it didn't, God is still in control. To notice the Son in the sun's rise, to breathe deeply of the Spirit with each sigh, to see and point out Jesus in our loved ones. Faith is a choice at first before it becomes a way of being. Surprise! I think I'm going to end here to give you a reprieve from my usual novel-length posts.